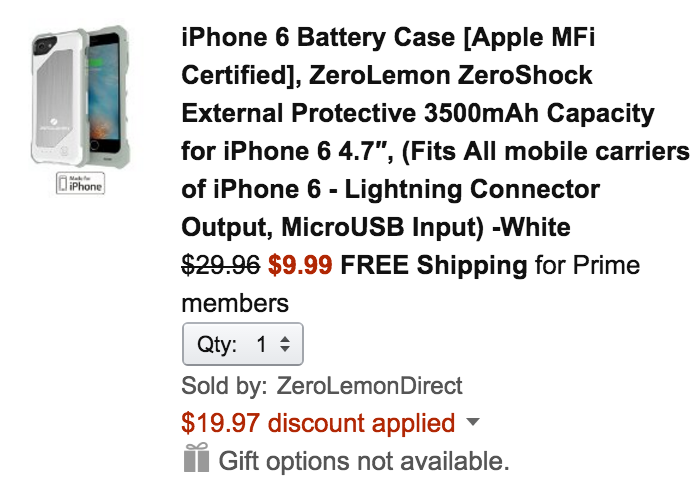 ZeroLemonDirect (100% positive feedback all-time) via Amazon offers its ZeroShock 3500mAh iPhone 6/s Battery Case for $9.99 Prime shipped after promo code SX8KKLB5 is applied during checkout. Note: you must choose the ZeroLemonDirect listing for the code to work (looks like this). That’s a $20 savings and easily one of the best prices we’ve ever seen on an iPhone 6/s battery case. Rated 4.2/5 stars by over 200 Amazon customers. ZeroLemon ZeroShock Battery Case increases the life span of your iPhone 6 Battery by 200%. This is achieved while maintaining a rugged case design with minimum added bulk. Basically, its the best of both worlds. ZeroLemon in house engineered the ZeroShock Battery Case with the professional in mind. The extended battery life is created with minimal bulk and maintains the sleek curves and feel of the iPhone. Your iPhone is an expensive investment and you will want to have this protected with the most reliable case. The ZeroShock comes with great protection to take on the small bumps and the hard impact shocks of daily life. The battery case comes with sync through technology that allows direct data connection between your iPhone and computer for files and iTunes content transfer.